There was a major announcement this morning to reveal a special edition PlayStation 4 console with a laser-etched Sengoku Basara hard drive bay cover. The console will be available in jet black and glacier white variants. It will be released alongside Sengoku Basara 4 Sumeragi on 23rd July 2015, to coincide with the series' tenth anniversary. The 23rd is the closest release date to the actual anniversary on 21st July 2015. 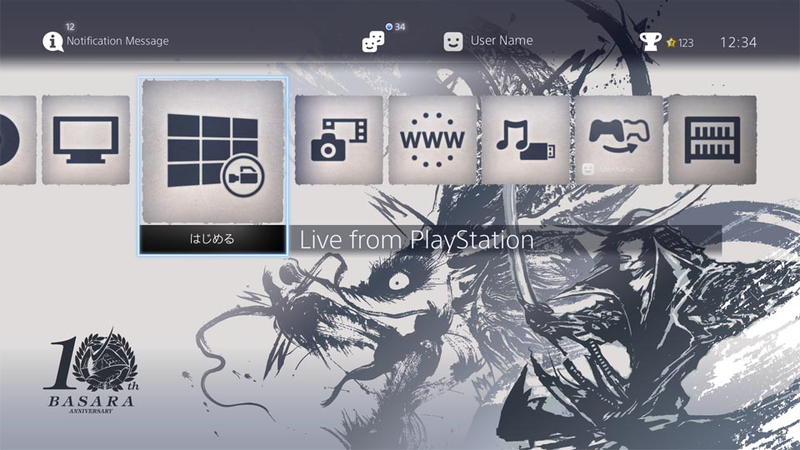 The special PlayStation 4 will also come with a matching custom theme. The bundle contains the PlayStation 4, a laser-etched Sengoku Basara 10th Anniversary Edition hard drive bay cover, the Sengoku Basara 10th Anniversary Edition Theme product code, a wireless Dualshock 4 controller, monaural headset, power cable, HDMI cable, USB cable. It does not include a copy of Sengoku Basara 4 Sumeragi. The set will cost ¥41,980 before tax when purchased through the Japanese Sony store, the exclusive distributor. Reservations open today. It will be made to order, so the delivery date may vary depending on when you place your order with Sony. I really like the way they've combined the classic Tsuchibayashi Makoto artwork with the dragon painting from Sengoku Basara 4. An appropriate anniversary design. Hi! Thanks again for the news! Is Sony Japan just for local people or for foreigners too? I would really like to buy it, but when it comes to giving the address, it seems to be for japanese people only. It's so beautiful, I want it!! It's just for local people, unfortunately. A forwarding service or deputy company should be able to help out if you want to place an order and don't mind paying some additional fees. If you do manage to get one, please take lots of pictures! Most likelyI'll end up not buying it (I already own a PS4 but I can swear it makes me wish for another one) I'm genuinely pleased they went with Tsuchibayashi-san's artwork. Very very pleased ^_^. I'd wish him to come back designing for the series. It's weird having so little Tsuchibayashi artwork in the series these days. I'd love to see him interpreting the Sengoku Basara 4 characters in his style at the very least; I bet he'd come up with some very interesting perspectives. It can't be too hard to get him back for some paintings even if he's too busy or expensive for creating actual designs, right Capcom?